Reeds Lake is a quaint little lake in the heart of the Grand Rapids Metro Area, which is itself a bustling area of economic and cultural activity. Located in East Grand Rapids, a suburb of Grand Rapids, Reeds Lake is the premier waterfront real estate destination in the Grand Rapids area. If you are looking for a lakefront home in Grand Rapids, Reeds Lake is the place for you and your family. Homes on Reeds Lake are only minutes from downtown Grand Rapids, which is the economic and cultural hub of West Michigan. Living on Reeds Lake gives you the feeling of a lake community while still allowing you the amenities of being close to the city. 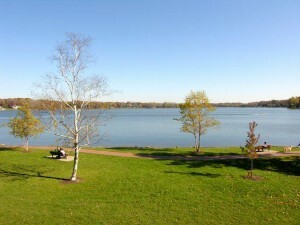 Reeds Lake is visible from East Grand Rapids’ John Collins Park and features modern restrooms, picnic tables and shelters, as well as a walking trail. A scenic lake, Reeds Lake is great to observe wildlife, including the great blue heron, the Canadian goose, and the trumpeter swan. If you want to go fishing right from your dock, Reeds Lake has largemouth bass, northern pike, sunfish, yellow perch, among other fish types that will suit the inner sportsman in you. Along with its natural fish population, the lake is also stocked with various fish species from the Michigan Department of Natural Resources. One of the coolest features of Reeds Lake is the footpath around the lake. There is a walking path and trail that goes around the lake and is just over four miles long. Plus, the lake and its surround areas are animal friendly, so you can take your dogs on a walk around the lake and enjoy the beautiful scenery. 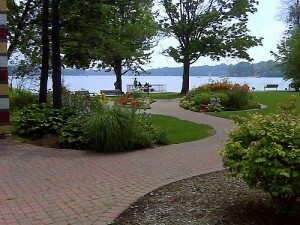 If you are a boater, you can join the Grand Rapids Yacht Club, which is located on the west end of the lake. If you have ever wanted to learn how to sail, the Grand Rapids Yacht Club offers sailing lessons and, due to its size and shape, Reeds Lake is an excellent lake on which to learn. If you would like to see yourself in a home on Reeds Lake, be sure to check out our listings page or send us a note using our contact page.